The Chausie is a hybrid of domestic cats and wild Jungle Cats. This graceful, muscular cat, despite its large size, is sweet-natured. The Chausie, also known as the Jungle Curl, Stone Cougar, or Mountain Cougar, was created by cross-breeding Jungle Cats with domestic cats (Abyssinians and domestic shorthairs). The breed’s name was derived from the scientific name for the Jungle Cat: Felis chaus. As a relatively new breed, the Chausie has not been accepted by the Cat Fanciers’ Association, but it has been recognized by The International Cat Association (TICA) under the organization’s Evaluation status. The Chausie is a big, strong cat, approximately twice the height of the average domestic cat, and up to 3 times as heavy. Chausies weigh 12-25 pounds on average, with males weighing in at the heavier end of the spectrum and females at the lighter end. Chausies take 2-3 years to reach full size. The torso of the Chausie is long, svelte, and solid, and its legs are long. The Chausie’s hind legs are slightly longer than its forelegs, giving the cat a statuesque, appearance that adds to the overall wild look. Chausies may be as tall as 18 inches from paw pads to shoulders. Feet are relatively small in relation to the cat’s overall size. The coats of Chausie kittens may have spots or stripes that fade as they mature. The Chausie’s head is wedge-shaped, with a sloping forehead, angular elongated cheekbones, and a full muzzle and chin. The oval eyes are gold, hazel, or light green. Ears are tall and wide at the base, with rounded tips, and are spaced relatively close together on the head. Athletic, curious, and intelligent, the Chausie is always on the move and requires a lot of exercise to dispel its considerable energies. Chausies are also assertive, though not usually aggressive. Chausies have some abilities that reflect their wild heritage, including an extremely fast running speed and the ability to jump nearly 6 feet in the air. These cats tend to spend a lot of time playing with toys that enable them to practice their hunting skills. They are also inclined to steal and hoard small objects. Despite their wild heritage, Chausies tend to be sweet-natured, affectionate, and very loyal. They are good with older children and pets that are similar in size, such as other cats and dogs, as long as the introductions are handled correctly. However, they are not the best choice for homes with very young children or those where small animals such as birds are kept. Anyone who adopts a Chausie should be prepared to care for a highly energetic cat that takes up a lot of space and requires a lot of interaction. Some Chausies cannot tolerate gluten, and may require special diets. Of course, high-protein, low-carbohydrate diets are ideal for all cats, not just Chausies. Chausies are usually quite fearless. As such, they are likely to get into serious trouble if allowed to roam freely, so keeping them indoors is recommended for their safety. 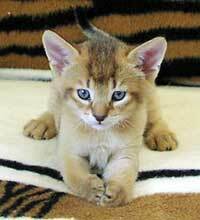 Chausies are expensive, with Chausie kittens costing $400-$2,000. To adopt an adult Chausie in need of a loving home, visit the Chausie Rescue site or sign up for the Chausie Mailing List at RescueMe.org to be notified when Chausies become available for adoption. Jordon, E. (15 August 2006). “Chausies Are Wild at Heart.” CatChannel.com. The International Cat Association (TICA). (2008). 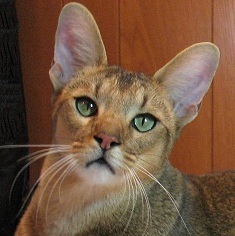 “Chausie Breed Standard” and “Chausie.” TICA.org.